We might be correct in assuming its limited appeal—until we begin reading the latest translation of The Inferno, part one of the three-part epic. This is a major accomplishment in the art of translation and should appeal to the modern ear in ways that older and perhaps more chronologically accurate translations will not. Durante degli Alighieri, who is more familiar to us as Dante, wrote The Divine Comedy when he was about 35 years old, placing its composition at about 1300 ACE. At least that is the accepted scholarly opinion inferred from the texts. It’s composed of 100 cantos, or divisions, of which 34 are devoted to The Inferno. The narrative, for those who may not be familiar with it, begins when the poet gets lost in the woods, symbolic of a distracted mind. He meets the spirit of the classical Roman poet Virgil, who undertakes the task of guiding the Dante through the afterlife. Virgil claims to have been asked to do so by the spirit of Dante’s greatest love, Beatrice, who died young and whom Dante still mourns. Virgil leads him through Hell and Purgatory; Beatrice for obvious reasons accompanies him through Heaven. Of the three, The Inferno is best known and for good reason. Dante routinely places his enemies, those with whom he disagrees, and those whom he despises in one of the nine descending circles of Hell where they endure the most delicious tortures a poetic imagination can devise. And velcroed itself to him. Then with a fang, it bit through both cheeks at once. To the medieval mind, Hell, Purgatory and Heaven were real geographic locations and the torments were also very real outcomes of sinful lives. Yet we can’t help but think Dante might have had a bit of fun devising those punishments and fitting them to the crimes he witnessed. There is after all one good reason it is called The Divine Comedy. It is fiendishly funny. In this new translation, the dark humor of the original is allowed full rein. Mary Jo Bang, herself an accomplished poet, brings her own peculiar voice to the translation, which is only right. Every translator does that. At least the best ones do. But in this case, the voice results in some pretty glaring anachronisms. For example, Eric Cartman is in the third ring of Hell. E’n as thou seest, I with fatigue am worn. Have by like crime incurr’d like punishment. That every pocket and purse overflows with it. The fault that did me in was gluttony. As you can see, Because of that, I’ve been ground down by this rain. It may be that the purist will prefer the former, but for sheer readability, perhaps the latter is preferable. It’s a matter of individual choice, but really, the second one is far less obscure and pedantic. It might be argued that the intrusion of references unknown to the 14th century ruins the work. At first we may well be put off by such phrases as, “You’ve seen one at a roulette wheel,” or “But first, each used his tongue to signal his leader with a raspberry,” but it can be legitimately argued that they give the text a vitality and charm that is somewhat lacking in translations that are more true to the period. In any case, surely previous translations still exist and those who prefer a more classical treatment are still free to go there. What Mary Jo Bang has accomplished is the opening up of what is often an arcane and esoteric text to the 21st century audience. We might ask, though, “What audience? Why would anyone want to spend an evening reading Dante’s Inferno in any translation? It’s a good question. It is highly probable that, however appealing the translation is, the audience will be a small and rather select one. We can’t escape the possible reality that the medieval concept of Heaven and Hell just aren’t all that interesting to modern people, yet many contemporary belief systems are rooted in medieval concepts that are still very much alive in some segments of the population; however, reading it for reasons of knowing where certain beliefs come from borders on pedantry. We must conclude that the Mary Jo Bang translation is, therefore, not written to please the general public or a cadre of scholars. It is clearly a labor of love, an homage from one poet across eight centuries to another, a work that is likely to be hailed by modern poets and those who appreciate their work. And on the other end of the spectrum, it inspired cartoonist Jimmy Hatlo to create “Hatlo’s Inferno” in the 1940s where he, like Dante, placed the most annoying people he knew in Hell with appropriate punishments calculated to make people nod and laugh. Each canto is followed by extensive notes explaining the substitutions made and references in the text, with the history of each, that may not be familiar to modern audiences. The illustrations by Henrik Drescher are powerful and irreverent, perfectly harmonizing with the style of the text. Dante’s Inferno will continue to be a presence in the 21st century. 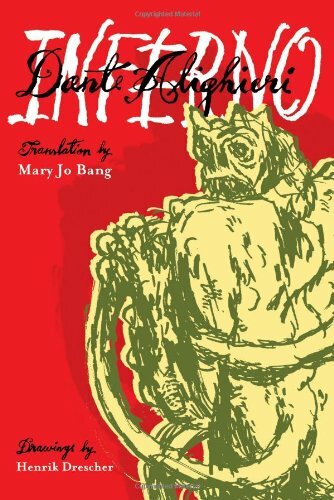 Now thanks to Mary Jo Bang’s updated, humorous, and lively translation people may actually want to read it. Dante himself would probably applaud.